So I've decided to start writing down all of my Tutor's (Tony) analogies, mainly because half the time they confuse the hell out of me but also I just wonder where he gets all of these from. As as starter to this ever continuing string of posts I will spoil you with 4 of his most recent ones, or at least the ones I could remember. How about being The Shakespeare Production group rather than Mrs. Smith's reception pantomime. Although the title is majorly confusing, I can tell you it's much more simple than it seems. I'VE JUST GOTTEN MY THIRD GRADE AT 1ST LEVEL FOR THIS SEMESTER! WOOOOOO! Right now back to seriousness; I was set the task to design an info-graphic 'ISSUU' publication on a certain topic with a group member of your choice. Naturally I chose a good friend (Sophie) and we were randonly selected the question "How did Roman's build their roads straight?". Firstly we looked into styles that we might want to follow and on deciding that using our strong points would be the best idea we made a pastiche document of comics and an Ikea manual. It sounds a little odd but the design for Ikea is very obvious and well structured so I could easily work with making it stylish and suiting whilst using strong typography and paragraph text. Sophie on the other hand is very dab-handed with character design and it a total nerd for comics, which really helped up decide that a comic style for this publication would be the best option (also because the terrible person she is managed to get me hooked on them also). We researched the basics; How, why, when, where and who and began to sketch storyboard and mock-up designs. Not to bore you all to death we ended up with a lovely final piece, which may I add the tutors also liked and graded highly. So here you are, Enjoy and learn something you uncultured swines. P.s Sophie isn't a terrible person really. P.p.s You aren't an uncultured swine! 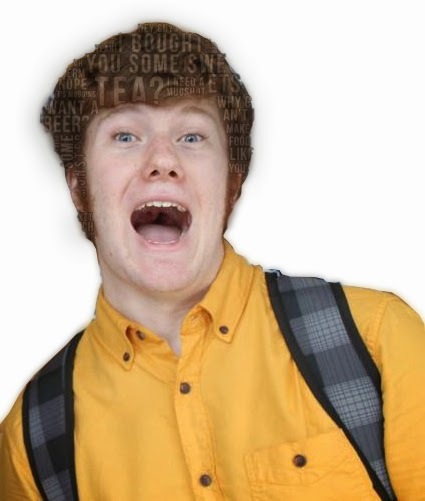 The other night, I was rather tired, unable to sleep and lost with what I should do; so as every normal person with Photoshop would do, I edited my friend's hair. I decided that I wanted to capture everything that made up James in words re-creating his hair, as his hair is a very important and significant part of James. 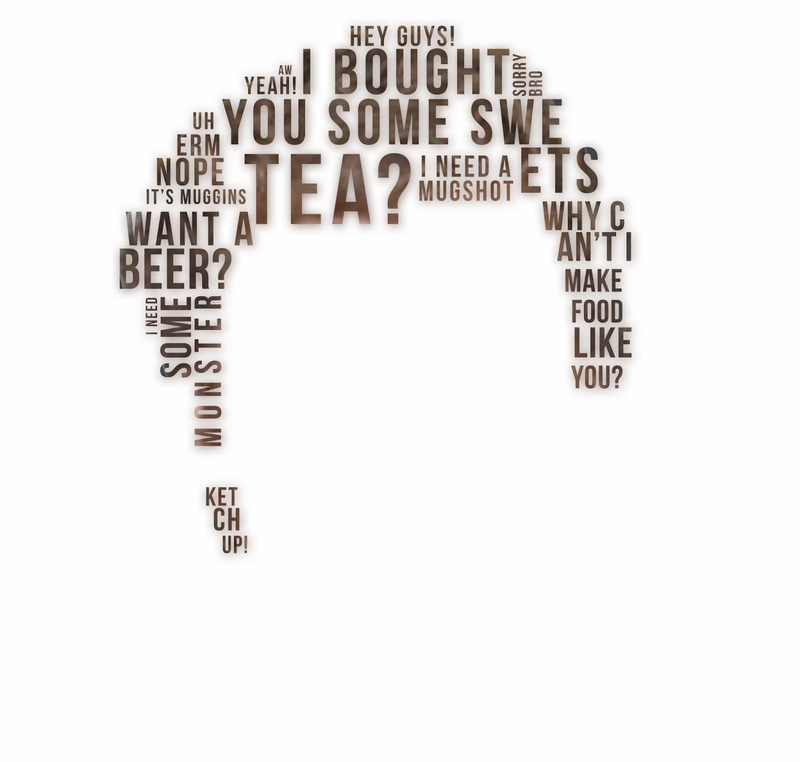 If you look closely you will be able to see the largest word is "Tea?" 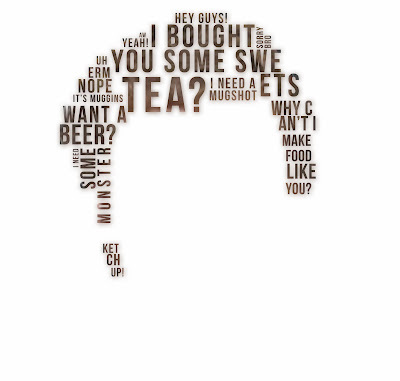 as the most commonly thrown word between him and myself is either "Tea?" or "Cuppa?" of which the response is never ever ever a no. I quite like these for the humour rather than the actual aesthetics as it was a 15 minute job and it was more to create the style and personality of James than a pretty image; either way, I love it and so does he. Without further re-due I present James Reay. Look at the excitement in those eyes. I'm not sure if this does the hair justice.